In the section of the Letter to the Colossians with the quoted verse Paul is speaking about becoming new creations in Christ. We become the image of God before the fall (the moment our first parents disobeyed and stepped away from God) through Baptism. We strip off our old self, pushing away things like; anger, fury, malice, slander, and obscene language. We are the image of the creator, a new creation in Christ. Having stripped off our old self we put on our new self; God’s chosen, holy, beloved, compassionate, kind, humble, gentle, patient and forgiving. We put on love and the bond of perfection. 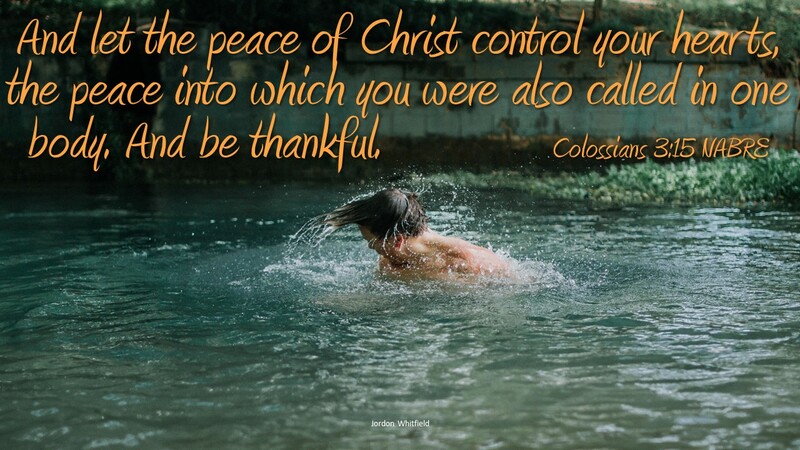 We let the peace of Christ be in our hearts. By peace we mean being in right relationship, self-giving, self-denying love practiced in Christian community, which models the self-emptying love of the Son for the Father. Then we let the Word of God dwell in us and we go on singing and praising with gratitude to God. For Paul this is a very real conversion. We can see it as being dipped into the waters of Baptism and our old ways are washed off, and as we come up the water appears like new armor of Christ. We put on Christ and remain in His image. We have a purpose, and it is not lived without meaning and then we die. Our purpose is to be Christ like, to serve one another, to worship God, and to join together becoming brother and sister in Christ. We are to live the love God has for us, for one another. We do this becoming new, accepting Christ in us and us in Him. Then we see the world with our new Christ image, not trying to be the best, to defeat others, but to raise others up and work so that all win. Do you see yourself as someone new having been baptized? Are you self-denying like Christ?